This one may seem like such common sense but if you don't put it on your calendar to exercise it most likely will not happen. Taking care of yourself can so easily get pushed to the bottom of the list. While you can function that way temporarily it is not a long term solution if you want to be the best wife, mom, friend or employee. You must make a date with yourself to take care of your body so you can have the energy and stamina to do all God has called you to. Find what time of the day works best for you then stick to it. Before you know it exercise will come as natural as brushing your teeth...you feel yucky when you don't do it! Now that you have found your time you will exercise figure out your how. I love to tell people to do something they enjoy. God created our bodies to move and function in a beautiful way. Too often we get into the comparison game and think we have to exercise exactly like someone else. But the problem is if you hate the format of exercise you chose you will have a very hard time sticking to it. Do you like to run, walk, lift weights, dance, roller blade, play a sport or compete? Figure out what it is that makes you come alive when you do it. That thing is a gift God has given you to connect with him while you take care of the body He has given you. God would not ask us to honor our bodies and take care of the temple without creating a way for us to do that with joy and peace. 3. Do HIIT or Interval training. High Intensity Interval Training(HIIT) is my favorite and most effective way to lose weight and get in shape without spending hours in the gym. A TABATA is an interval that consists of performing specifically chosen exercises at a very high intensity for 20 seconds, followed by 10 seconds of rest. The beauty behind these short microbursts is that 20 seconds at high intensity is doable and the 10 second rest allows for brief recovery before moving on to the next exercise interval. This short duration, but high intensity interval training (HIIT) creates a prolonged afterburn, or EPOC (excess post oxygen consumption). This type of training causes the body to take longer to return to its state of rest, so it continues to burn calories (5x more) at a higher rate long after the workout session has completed. Put simply, a 4-minute Tabata workout can reap the same benefits as a longer but steady workout, like running for a half hour. You can focus your Tabata on lower, upper, core or cardiovascular activity. I recommend doing a strength Tabata first so you use your immediate energy stores then follow it by a cardio Tabata since you will already have used all glucose in the strength round and will need to utilize fat for energy for cardio. Put those two together and you are done in 8 minutes with the same effects as a 30-45min run! Lower Body example: Sumo squat, lunge, X-jumps, Plyo lunge(repeat). Upper Body example: Pushups, Overhead press, moving pushups, V-pushups(repeat). Cardio example: High knees, sprint, squat jump, mountain climbers. The possibilities are endless here, be creative!! 4 4. Use fun and free tools! I recommend the free Tabata Timer app. You can also get a GymBoss for $20 and set your intervals for different times. I like to wear it while exercising and then it vibrates or beeps when it's time to rest or change exercises. I love using Gliding Discs for core and lower body. You can also use paper plates(if you have hardwood or tile floors) but they wear out easily so the investment in these are worth it. I've had mine for 8 years and they are still in great shape. You can see some examples of exercises to do with the discs here. Nike Training Club(NTC) is another great, free app you can use to do 15, 30 or 45 minute workouts. 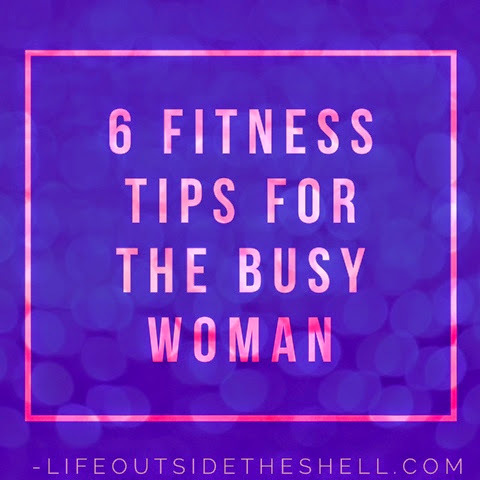 You get to choose from Get lean(cardio), Get toned(light weights and intervals), Get Strong(strength) or Get Focused(15 minutes workouts to target specific areas). When you complete a workout it saves and you get points so you unlock badges(great if you are competitive). When you are in a crunch for time and can't make it the gym a great option are BeachBody programs. I have used several of them to lose post baby weight with my favorites being P90x, Insanity, ChaLean Extreme, 21 Day Fix and PIYO. 5. Get an accountability partner! Everything is so much better with a friend so find someone to exercise with or just hold each other accountable. If you enjoy working out in groups find a class that you love and don't be afraid to try new ones! One of the best ways to train our bodies is by cross training which means we change things up and try new things to keep our body guessing. I don't have time in this post to address nutritional advice, however, I will give one healthy eating tip. Fuel your body with fresh fruit, veggies, healthy fats and proteins....and do NOT starve yourself! Food is our friend, not our enemy. 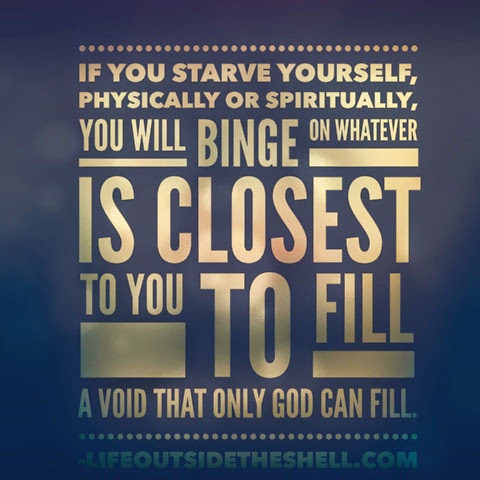 We also need to fill ourselves with God's word so we fill the hole in our soul that only He can fill, which keeps us from turning to food for comfort.